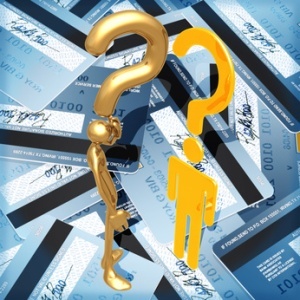 Home > FAQ > What Is a Credit Card? A credit card is a small card, usually plastic, issued to card holders. Card holders can use the card to make payments with the credit card instead of using other methods of payment like cash, debit card, or check for example. Credit cards are accepted almost everywhere these days. You can also make online purchases with your credit card. Credit cards are generally 85 by 54 millimeters in size; they are designed to be fairly small so they fit easily into wallets. The concept of using a card to make purchases dates back to the late 19th century, but credit cards did not truly start to “take off” until the 1970’s. Credit cards are different from debit cards in that you are using borrowed money when making a purchase with a credit card. When you complete a transaction with a debit card you are using money from your bank account, it is like writing a check, just easier and faster. When you make a payment with your credit card the credit card company pays for the purchase and expects you to pay them back over time, with interest, in the future. Making purchases with an unsecured credit card is practically accepting short term loans. To summarize, the primary difference between debit and credit cards are that you use your own money when using a debit card and you are basically accepting a loan when making a purchase with a credit card. Credit card companies make their money two different ways. The first way is by charging interest on their customers balance each month. The average credit card has an APR, or interest rate, of 15% a year, which means a credit card company, would make 150 dollars in interest alone if a customer keeps a balance of $1,000 throughout the course of a year. Another way credit card companies make money is through fees, the most common fee for a credit card to have is an annual fee, where you have to pay a sum of money just to own a credit card each year. I do not recommend owning any credit cards that charge an annual fee. There are dozens of other potential fees as well that you will have to look out for. While credit cards were portrayed in a negative light in the two paragraphs above, they have many advantages versus a debit card. Credit cards are generally more secure and safer to use than a debit card. If anyone ever takes your credit card you can cancel your account immediately and you should be able to charge back any purchases that were made that were not from yourself. It is tougher to get your money back in this situation with a debit card. With identity theft becoming one of the most popular crimes this is something to take into consideration. Also credit cards can come with nice bonuses; many credit cards will reward their cardholders by giving them 1-3% cash back on all their purchases. Obviously this will not amount to much if you struggle to spend a few hundred dollars a month with your card, but if you make big purchases small percentages can really add up. While some credit cards do not offer cash back, others offer reward programs were you can exchange points for goodies such as technology items or free airplane tickets. It is also important to remember that almost all negatives associated with owning a credit card can be avoided if you are smart and disciplined enough to act financially responsible. Believe it or not you do not have to pay interest on your purchases with a credit card. Almost all credit cards have a 25 day grace period where your purchases are interest free if you pay them off within 25 days of receiving your statement. Considering the average credit card charges an APR of 15% this can help out a ton. Another negative associated with credit cards is that they charge outrageous fees, almost all financial instruments have a ton of fees tagged along with them. Mortgages have fees, savings accounts have fees, and many ATM’s charge a few dollars just to use them! Also there are plenty of reputable credit cards available that do not charge annual fees of any kind. Perhaps the biggest plus, or minus, to owning a credit card is its impact on your credit score. If you stay well within your credit limit [never exceeding 30% of your credit limit] and you pay off your purchases as quickly as you can owning a credit card can cause your credit score to shoot up. Creditors love loaning out money to people who have proven they can handle credit responsibly. On the other hand, if you fail to make your monthly payments in a timely manner and you exceed your credit limit you will find that your credit rating will sink very, very low. This is a double edged sword, you need to make sure you understand how serious owning a credit card is before you apply for one. Credit cards are not inherently good or evil; they are what you make of them. As long as you understand the ramifications of your actions with a credit card you have the green light to start applying for cards that catch your eye online!